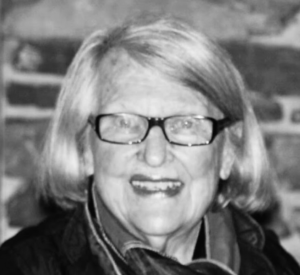 Long-time Chestnut Hill Resident, Adrienne Sachs (nee Glock), 90, died February 13, 2018 at Chestnut Hill Hospital. Born and raised in Johnstown, PA, Adrienne graduated in fashion from Stephens College. She worked in New York City where she met and married Daniel Sachs. Later they moved to San Francisco where she raised her three children. In 1973 she relocated to Chestnut Hill where she worked for many years at the Germantown Friends School. She was an avid gardener and a wonderful cook who enjoyed entertaining, food, art, music and playing the piano. She approached life with a great sense of style. She was a member of Greene Country Garden Club, the Philadelphia Cricket Club, the Philadelphia Museum of Art and was a volunteer at Historic Wyck House. Adrienne is survived by her children: Catharine Lopez and husband Ernie, Daniel Sachs and partner Kevin Lindores, Jamie Sachs and her grandchildren: Emily, E.J., Jordan and Megan. “A”, as she was known to many, will be sadly missed by her sister Carol Glock Seving and the whole Seving family who all adored her.